This is a really simple one function output decoder. It's really cheap and small, perfect to install in those cars where you want interior lighting. I only miss the possibility to set up the output intensity like Uhlenbrock decoders, but on the other hand you can set up special effects (strobe, blinking, ...) and the frequency for that effects. 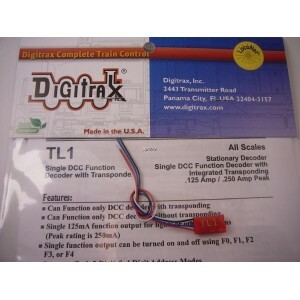 It has also transponding possibilities, but only if you use Digitrax stations. I deactivated it since I'm using Uhlenbrock Intellibox.